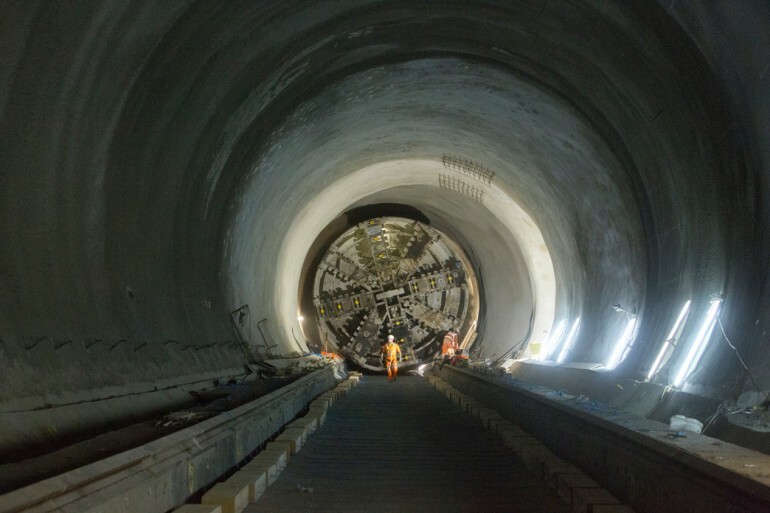 Crossrail’s Breakthrough exhibition to launch at London Transport Museum - Crossrail . For information about the Elizabeth line please visit the Transport for London website. A new exhibition Breakthrough: Crossrail’s tunnelling story, will give visitors an experience of London's hidden subterranean landscape when it opens to the public on 1 February at London Transport Museum, Covent Garden. The exhibition brings to life the sheer scale of the work being done to deliver Crossrail, the new railway that will bring a 10 per cent increase to the city's rail capacity. Visitors will experience the tunnel environment, learn about the way Crossrail is burrowing under London, play interactive tunnelling games and hear the first hand experiences of those who work underground. The exhibition will feature a large, five metres high, walk-through installation of a cross-section of a Crossrail tunnel to allow visitors to experience what it might be like to stand in a tunnel which is under construction deep underground. The tunnel will contain a computer simulation of a giant boring machine in action, just like the one being used to dig Crossrail’s tunnels. Crossrail’s tunnel network will be joined up for the first time in spring when Tunnel machine Elizabeth reaches Farringdon in the big East-West breakthrough. The new line will run for more than 100km from Reading to Heathrow in the west, and to Shenfield and Abbey Wood in the east, via Central London. Shoppers will be able to buy gifts and toys inspired by the Crossrail tunnelling story such as a crocheted mole and elegant posters. Design enthusiasts will love the new contemporary homeware gifts which are made from materials similar to those used in the building of Crossrail. There is a collection of gifts moulded from concrete which are inspired by Crossrail’s tunnelling achievements. All the above Crosssrail related items will be available to buy in the Museum’s shop in Covent Garden and online at https://www.ltmuseumshop.co.uk from the opening of the exhibition. Sam Mullins, Chief Executive at London Transport Museum, said: “I am sure visitors to the Museum will enjoy finding out more about Europe’s largest infrastructure project at our latest exhibition called Breakthrough: Crossrail’s tunnelling story. Entry to the Museum is free for children and young people aged 17 and under. Adult tickets are £16.00 (£11.50 concessions) and allow unlimited admission the Museum’s galleries and temporary exhibitions for 12 months. The exhibition Crossrail Breakthrough: Crossrail’s tunnelling story included as part of the £16 admission fee. The Crossrail route will pass through 40 stations and run more than 118 km (73 miles) from Reading and Heathrow in the west, through new twin-bore 21 km (13 miles) tunnels to Shenfield and Abbey Wood in the east.